How Many Calories in 1/2 Cup Ground Flaxseed? Derived from the seeds of the flax plant, flaxseed oil is a rich source of omega-3 and omega-6 fatty acids. It also contains the essential fatty acid alpha-linolenic acid, which is a biologic precursor to the omega-3 fatty acids found in fish oils, according to the Mayo Clinic website. Despite its many health benefits, flaxseed oil has a laxative effect that may cause some discomfort, prompting diarrhea. 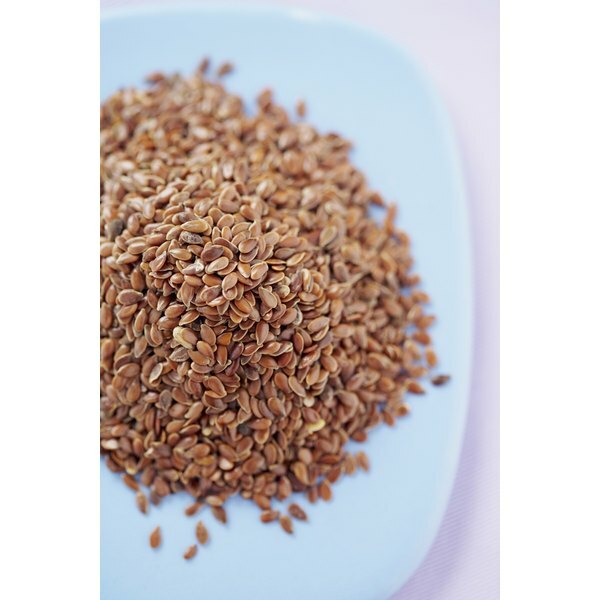 Flaxseed oil is a folk remedy traditionally used to treat constipation and may be a useful treatment for other conditions, such as attention-deficit hyperactivity disorder. Flaxseed oil is a source of the same omega-3 fatty acids found in fish oil. But the University of Maryland Medical Center reports that research is conflicting as to whether flaxseed oil has the same health benefits. The University of Maryland Medical Center reports that clinical studies do support the use of flaxseed oil to decrease your risk of heart disease and lower bad cholesterol. Research on the laxative effects of flaxseed is inconclusive, according to the Mayo Clinic website. Flaxseed oil, if taken in small enough doses, should not bother your gastrointestinal functioning. But using amounts greater than 30 g per day, or 2 tbsp., might result in adverse side effects. When taking flaxseed oil in high amounts, you may develop gastrointestinal upset and diarrhea, reports the EMedTV website. The University of Maryland Medical Center recommends that adults take 1 to 2 tbsp. per day as a therapeutic dose. Only use the recommended dose of flaxseed oil unless otherwise directed by your physician. If diarrhea does not subside, you may need to discontinue use of flaxseed oil altogether. According to the Mayo Clinic website, most bouts of diarrhea will stop without treatment within a few days. The website further suggests removing the food source causing the diarrhea, in this case the flaxseed oil, and ensuring that you consume plenty of fluids to prevent dehydration. Over-the-counter anti-diarrheal medications may provide relief until symptoms subside. If you discontinue using flaxseed oil and symptoms persist, contact your doctor to rule out another underlying cause for the diarrhea. Your choice of alternative supplements will depend on the condition you are attempting to treat with flaxseed oil. For the general benefits of omega-3 fatty acids, consider switching to fish oil. If you are treating constipation, the University of Maryland Medical Center suggests nonmedical approaches to encouraging regularity. The medical center suggests regular exercise and increasing your intake of fiber-rich foods, such as fruits, vegetables and legumes, whole-wheat breads or a small amount of psyllium fiber added to yogurt or a smoothie. If you must select a laxative, consult with your pharmacist or doctor to decide on the right one for you.